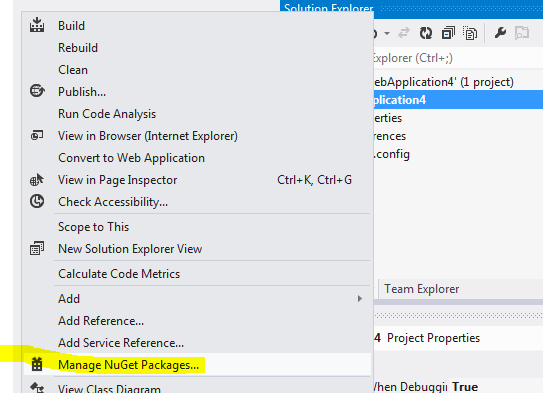 NuGet is a package manager that helps developers to automate the process of installing and upgrading packages in Visual Studio projects. It is free and open source. You can see the project in codeplex from the below link. Now days developers needed to work with several packages or libraries from various sources, a typical e.g. is jQuery. You will hardly find a website that not uses jQuery. When you include these packages as manually copying the files, it is difficult to task to update these files as new versions get released. 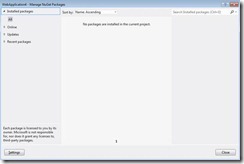 NuGet is a Visual studio add on, that comes by default with Visual Studio 2012 that manages such packages. So by using NuGet, you can include new packages to you project as well as update existing ones with the latest versions. 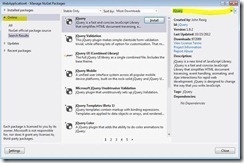 NuGet is a Visual Studio extension, and happy news for developers, it is shipped with Visual Studio 2012 by default. 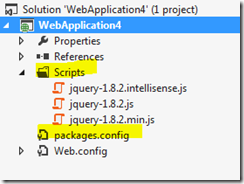 In this article, I am going to demonstrate how you can include jQuery (or anything similar) to a .Net project using the NuGet package manager. 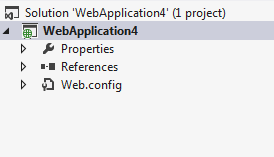 I have Visual Studio 2012, and I created an empty ASP.Net web application. In the solution explorer, the project looks like following. 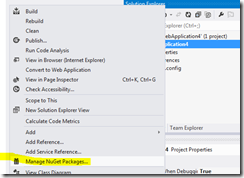 Click on the Manage NuGet Packages options so that you will get the NuGet Package manager dialog. Since there is no package installed in my project, you will see “no packages installed” message. From the left menu, select the online option, and in the Search box (that is available in the top right corner) enter the name of the package you are looking for. In my case I just entered jQuery. Now NuGet package manager will search online and bring all the available packages that match my search criteria. You can select the right package and use the Install button just next to the package details. Also in the right pane, it will show the link to project information and license terms, you can see more details of the project you are looking for from the provided links. 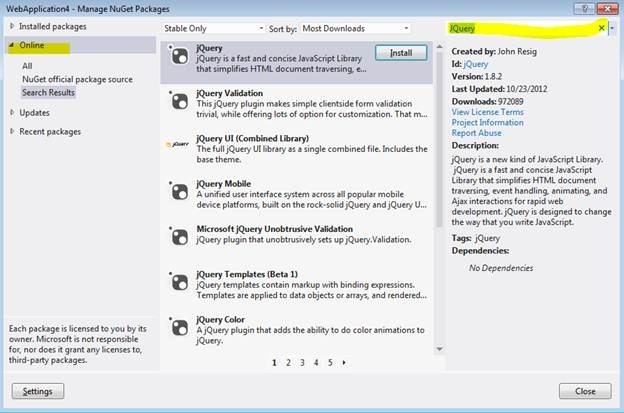 Now I have selected to install jQuery. Once installed successfully, you can find the green icon next to it that tells you the package has been installed successfully to your project. Now if you go to the Installed packages link from the left menu of package manager, you can see jQuery is installed and you can uninstall it by just clicking on the Uninstall button. 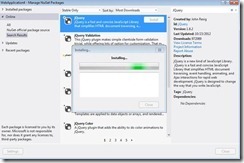 Now close the package manager dialog and let us examine the project in solution explorer. You can see some new entries in your project. 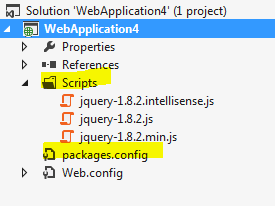 One is Scripts folder where the jQuery got installed, and a packages.config file. The packages.config is xml file that tells the NuGet package manager, the id and the version of the package you install. Based on this file NuGet package manager will identify the installed packages and the corresponding versions. 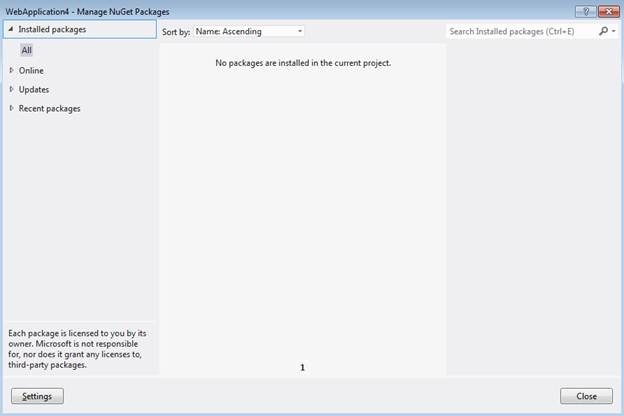 Installing packages using NuGet package manager will save lot of time for developers and developers can get upgrades for the installed packages very easily. I don't see an "Uninstall" button when I go to my install packages view. I see a "Manage" button. If I click this, it says to select the boxes for the projects you want to install it to and uncheck the ones you want to uninstall it to. Unchecking it to uninstall doesn't seem to do anything though. Anyone else seeing this?